The surviving inside herbs are the boxwood basil and the sweet basil – and a scraggly little sage plant. I’ve recently gotten garlic sprouting and I’m hoping to be able to harvest my own garlic. Once I get used to it’s growing cycle I hope to plant it regularly. Ginger, which is supposed to be tremendously easy continues to elude me. I am going to order a ginger plant and go from there. 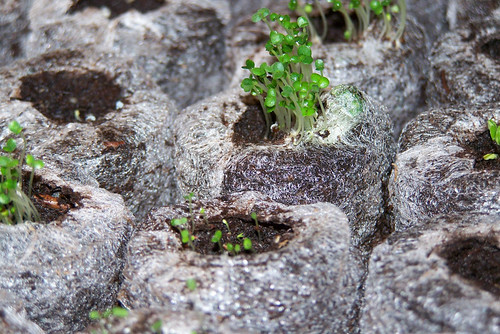 The stuff from the grocery store may be treated to not sprout. Maybe if I ever get to the organic store up in the city. I’ve been sprouting herb seeds. Some are enthusiastic, some are making me really impatient. Some with teeny tiny seeds were over-planted and badly need thinning already. I hope to get a better survival rate doing the sprouts the proper way. 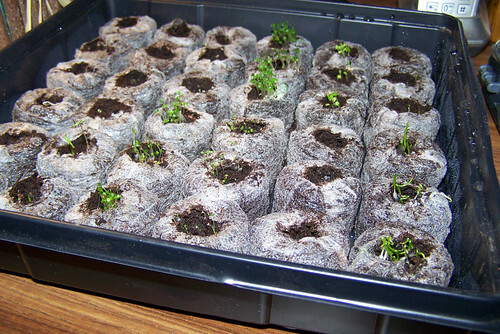 I tried to sow them directly – when the thyme was still alive – and trying to get the watering right without smushing the little plants was…well, impossible. You are so very ambitious!! I admire how hard you’re working to grow these. I am strictly a fair weather gardener. At the least sign of failure, I give up!! That’s not true! Your flowers wouldn’t be so pretty if you didn’t work at them. Next Next post: remember the days when you just opened a can of the cheapest cat food made?